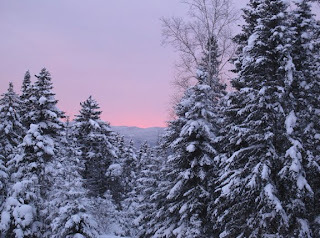 Good Monday morning from the snowy Adirondacks! The snow took a day off this past sunny Saturday but resumed working yesterday on behalf of skiers and freshened the ski tracks to perfection. The freshening continues with light snow falling as I type these words. There is a great deal of wonderful news to relay from the Adirondacks from all the world today, but readers will have to be content with this ski report for now and check back later for the news. Skiing is great in New York State, especially in the Adirondacks! !